Try this and trust me guys, the taste would be like drinking in punjab in the hot summer.This recipe for all my punjabi out there,who love mangos! 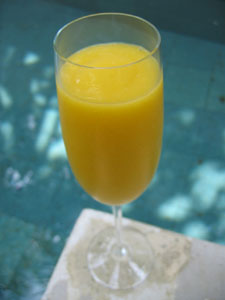 first take your fresh mango and peel it off and cut it aside,then in the blender mix the mango,milk,almonds,and sugar. finally blend everything well.and enjoy the taste of fresh mango shake!enjoy guys! hi kamani! I love really love mangos too. love your recipe. I am also in queens. What part of queens are u in? I am in Flushing.